Before Project Babylon, Gerald Bull had some rather more practical pursuits. One of these was the Extended Range, Full Bore shell. Let’s take a look. 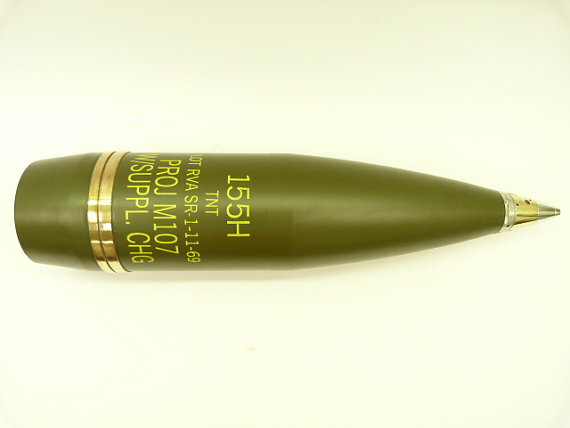 Here’s a standard 155mm HE shell from the time period, the M107. It’s quite fat, and it has to be. Those brass rings are the driving bands, and they engage the rifling of the gun to be sure the shell spins. The driving band also drives the design of the rest of the shell and the placement of its center of gravity. This design is not very good from an aerodynamic perspective. Bull reasoned that if he could only get some other way for the shell to engage the rifling and spin, he could improve the shell. And this is Gerald Bull’s Extended Range, Full Bore (EFRB) shell, also in 155mm. We can see that it’s much narrower. While this example doesn’t have the driving band on it, it should have one down near the base where the grey rubber ring is. There are also some curious nubs about the midsection. These nubs help stabilize the longer shell in the gun barrel, since the rifling interface is lower.1 Once we change that part of the structure, we can narrow the shell body and improve its aerodynamic qualities. The end result was much improved range, though at the cost of accuracy. More range could be attained with base-bleed or rocket-assist packages for the shell base. Let’s get to some data. M107 95 lbs. 2,210 fps 11.1 mi. 194 ft. 39 ft.
EFRB 100.4 lbs. 2,940 fps 18.6 mi. 620 ft. 138 ft. Figures in the table are from a 45 caliber-length barrel and a 23 L chamber. Probable Error is the figure such that 50% of shells fired will fall within that figure of the target. “In Line” is perpendicular to the range (i.e. we might think of this as ‘horizontal’ or ‘in bearing’). We can see that there’s a considerable increase in range, but also in dispersion. The accuracy issues meant that it was never procured by NATO in bulk, but the range meant that many other countries would seek out the shells. The South Africans found them very effective in border conflicts with the Angolans, giving the South Africans an option to strike back at the BM-21s2 of the Angolans. As always, what do we think? I really like EFRB. It gives artillery some options to reach out further. The accuracy loss is bothersome, but they needn’t be the only shells bought. And they at least give the opportunity for a longer range shot. Edited to fix errors spotted by Stewart Davies in the comments. Thanks, Stewart! This entry was posted in All and tagged militariana, procurement on July 5, 2018 by parvusimperator. Or you could just pick up SMArt 155, the Bofors BONUS, or the Excalibur for even more range and pinpoint accuracy on top of that. Guided, rocket-assisted rounds are expensive though, so perhaps you’d procure limited numbers for professional army peacetime units fully equipped with modern self-propelled artillery. Reserve and mobilization 2nd line units with older vehicles or towed artillery might be a good candidate for the much cheaper ERFB round. Probably should have made this clearer above, but here I’m looking at EFRB in the context of the time when it was unveiled. I.e. is it a good buy in the 70s? For the 70s, totally agreed on the extra functionality EFRB gives you. Regular non rocket-boosted SMArt 155 doesn’t give you additional range, but its still a bit better than the M107. From the shape of the EFRB shell, I wonder if there’s the exact same mass of explosive. Two mistakes that were made in the original article. The ERFB shell does have a”driveing ban” and it is larger than the one on the M107. The nubs you mentioned are there to center the projtile in the bore. They are what make the long pointed nose of the shell ride the bore with out”balloting”. It is the long pointed nose that gives it the longest range. By the way, the accuracy quote is for the first test ammo and was improved in production. Good catch. It does have a driving band, lower on the shell than the M107. Mea culpa; I don’t know what I was thinking when I wrote that.